Saudi Arabia’s Crown Prince Nayef bin Abdul-Aziz al-Saud has died for an unknown disease. 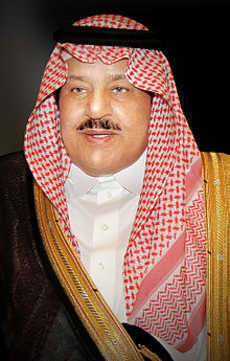 Reports say Crown Prince Nayef bin Abdul-Aziz al-Saud died just eight months after becoming heir to King Abdullah. Prince Nayef died in Geneva. Prince Nayef is prominent on supervising the security affairs of the state for more than 30 years. He is known for his successes particularly in fighting al-Qaida. At DC today, US Secretary of State Hillary Rodham Clinton expressed sadness on the passing of the Crown Prince Nayif bin Abd al-Aziz Al Saud. According to Ms. Clinton, Prince Nayef devoted his life to the security of Saudi Arabia and its fight against extremism. Crown Prince Naif was a key and valued partner for the United States, and he was a dedicated and courageous leader for Saudi Arabia, she states. In addition, Secretary-General Ban Ki-moon today also voiced his sadness at the passing today of Crown Prince Nayef bin Abdulaziz al-Saud, who was also Deputy Prime Minister and Minister of Interior of Saudi Arabia. The UN has recognized Crown Prince’s generosoty who also made a major contribution to the recent establishment of the UN Centre for Counter-Terrorism, which is based in Saudi Arabia.